Today is Thursday, Prosperity 101 blog & podcast day. 🙂 I usually do a little meditation & ask the Universe to guide me to pick out a card that’s useful to us all. We’ve got a Suze Oman card reading today – belief & courage are our messages. If you can believe that somehow everything happens for the best and you hold firm to this belief, especially doing troubled times or when you undergo what appear to be set backs in your life, then you’ll be able to draw the good out of any situation. You’ll be looking for the benefit – the hidden treasure- and you’ll be able to profit from even the toughest experience. 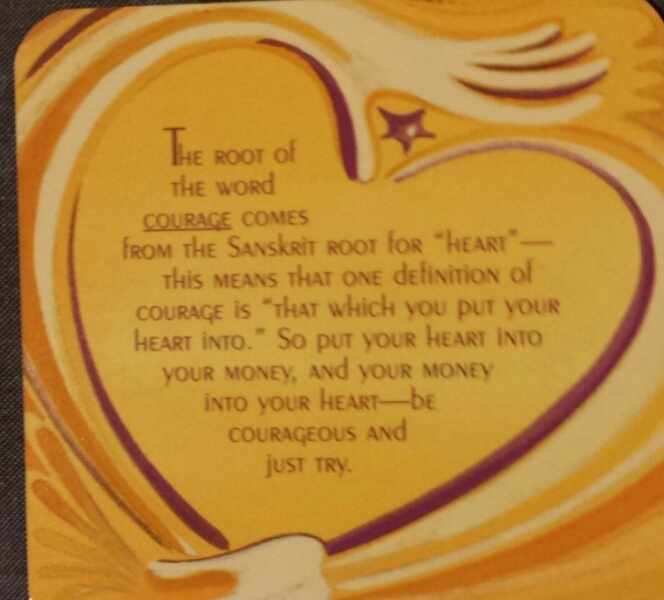 The root of the word courage comes from the Sanskrit root for “heart”. This means that one definition of courage is ‘that which you put your heart into’. So put your heart into your money, and your money into your heart, be courageous and just try. The only thing I would add is maybe we should evaluate the situation first & then move ahead! We musn’t confuse courage with foolishness & make bad investments. But somehow, our instinct will help us steer the correct course that will bring the highest good for us and everyone concerned I think. What do you think? Have you ever had a time when you had to get up your courage to make a financial leap & it worked out? Did you know, you can find all of the podcasts on itunes as well and subscribe?! Look for “stefsvoice4u Broadcast”. This entry was posted in Abundance, Inspirational, Motivational, Oracle/Colour/Angel card readings, Positive Affirmations, Work and Career and tagged abundance, joy, lifestyle, mental money management, motivational podcast, prosperity 101, self improvement. Bookmark the permalink.